Blood pressure is measured by two numbers. The first, or top number, is known as systolic blood pressure. It is the pressure when the heart squeezes to pump blood to the rest of the body. The second, or bottom number, is known as diastolic blood pressure. It occurs when the heart relaxes. Your goal for blood pressure is less than 120 and less than 80. If you have diabetes or kidney problems, your nurse or doctor may have a different goal for you. Always contact your nurse or doctor if your systolic—top—pressure is above 180 or your diastolic—bottom—pressure is above 110. Checking your blood pressure at home will help your nurse or doctor or nurse know if your numbers are normal or high. Ask your doctor or nurse to help you find the correct size home blood pressure cuff and quality monitor. Do not use finger or wrist monitors. Learn more about checking your blood pressure at home. Aim for 30-60 minutes of activity each day. Learn more about exercise and blood pressure. Reach a healthy weight. Learn more about how to reach a healthy weight. Eat a healthy diet and eat less salt (sodium). Learn more about how to eat less salt. You have the power to make changes to improve your health. Most people with high blood pressure need at least two medicines to lower their blood pressure to a healthy level. Your doctor or nurse may need to change your medicines to find what works best for you. This is normal. If you don't feel well after taking a medicine, call your doctor or nurse. Don't stop taking your medicine until you talk with your doctor or nurse. Your Brain - High blood pressure hurts the arteries leading to the brain and increases your risk for stroke (brain attack). Your Heart and Blood Vessels - High blood pressure hurts your heart and blood vessels and increases your risk for heart attack. Your Kidneys - High blood pressure hurts your kidneys and increases your risk for kidney failure. Blood pressure numbers are often lower at home than in the clinic. The goal for blood pressure at home is less than 120 (systolic—top number) and less than 80 (diastolic—bottom number). Choose a good home blood pressure monitor by asking your nurse or doctor for advice. Bring your monitor to your next appointment so your nurse or doctor can check the measurement. Do not use a finger or wrist monitor. Wait for at least 30 minutes after drinking alcohol or caffeine, smoking or exercise before you take a reading. Rest for at least 5 minutes before you take a reading. Sit with your legs uncrossed, your back supported and your feet on the floor. Rest your arm at heart level on a table. Measure your blood pressure in both arms the first time you use a monitor. Use the arm with the highest reading to take future readings. Take your blood pressure twice a day for 7 days. Take 2-3 readings in the morning before taking your medicines, and in the evening. Each reading should be 2 minutes apart. Use a log to record your readings or print the numbers stored in your monitor. Always take your log or bring your monitor with stored readings to show your doctor or nurse. Always talk to your doctor or nurse before starting or changing your exercise routine to find out what exercises are safe for you. Choose walking, biking, swimming and dancing. These are all good exercises for the heart and blood pressure. Exercise at a moderate pace for 30-60 minutes a day. You should be able to talk while you exercise. Warm up and stretch before exercise. Start walking or biking slowly, then increase your pace. Cool down! Walk or bike slowly and stretch for at least 5 minutes after you exercise. You can do three 10-minute exercise sessions or two 15-minute sessions per day. Set your alarm 15 minutes earlier and go out for a morning walk. Go for a 15-minute walk on your lunch break. Walk or ride bikes with family or friends after dinner. Join a gym or a group program. You can lower your blood pressure by losing weight or eating less salt, also called sodium. As part of a healthy eating pattern, the goal is less than 2,300 mg of sodium per day—about 1 teaspoon of salt. Ideal amount is less than 1,500 mg per day, especially if you have high blood pressure, are age 50 or older, or African American. As you eat less salt, your taste will adjust to the lower levels. It may take time to reach your goal but cutting your daily salt intake by 1/2 teaspoon can improve your blood pressure and your heart health. Most people get most of their sodium from packaged and restaurant foods. 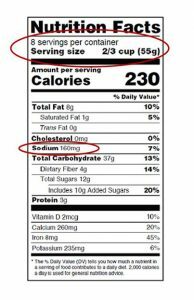 Read nutrition labels for serving size and mg. of sodium. Choose foods with lower sodium. Prepare your own food when you can. Don't salt foods before or during cooking or eating. Add flavor without sodium. Use herbs and spices. Choose fresh or frozen meats instead of processed meats. Check to see if salt water or saline has been added. Use fresh, frozen, low sodium or no-salt-added canned vegetables. Rinse canned foods such as tuna, vegetables and beans to reduce sodium. Choose fat-free or low-fat milk and milk products in place of processed cheese products and spreads. Choose unsalted or low-sodium nuts, seeds, chips and pretzels. Choose light or reduced-sodium ketchup, soy sauce, salad dressings and seasonings. At restaurants, ask for your meal to be prepared without salt and with sauces and dressings served on the side. When you choose healthy foods, you can help lower your blood pressure. Eat 1 cup of whole grain cereal instead of 2. Replace cheese with lettuce and tomato on your sandwich. Eat low-fat yogurt instead of toast and butter. Order thin crust instead of thick crust pizza. Eat whole fresh fruit instead of fruit juice. Use smaller bowls and plates for your food. Count your calories, then eat 100 less calories a day. Walk 30-60 minutes most days of the week. Eat smaller portions. Limit starch and protein portions to the size of a deck of cards. Fill up on salads and vegetables. Drink a large glass of water before your meal. Fill up on foods such as low-sodium soup. Keep a food diary to keep track of what you eat. Most people with high blood pressure need at least 2 medicines to lower their blood pressure. Know the name of each medicine you take. Carry a list of medicines with you. Know how and when to take each medicine. Know what side effects to report to your doctor or nurse. Tell your doctor or nurse about all of the vitamins, herbs, supplements and pills you take. Never stop taking a medicine without calling your doctor or nurse. How Do Blood Pressure Medicines Work? Use a weekly pillbox to help you remember to take your medicine, even if you only take one pill. Take your pills at the same time each day. Use a timer or alarm on your watch or phone to remind you to take your medicine. Write down on your calendar when you need to refill your medicine – at least 1-2 weeks before you run out. When you travel, carry your medicine list, and at least 1-2 days of extra medicine. Keep taking your medicines even if your blood pressure is at your goal. Ways to make your medicine schedule easier. Concerns you have about the cost of your medicines. If you don’t feel well after taking a medicine, call your doctor or nurse. Don’t just stop taking the medicine.